CHESS stands for Christian Home Educators of Sulphur Springs. It is a support group that consists of a parent-volunteer board, that oversees the group, and of families that homeschool their children. It offers events such as holiday parties, park play dates, moms/dads’ night out, field trips, book fairs, proms, graduations, and yearbook. It also offers sports and a teaching co-op. CHESS Sports offers girls volleyball, girls’ basketball, boys’ basketball, and high school fishing. It is operated by a separate board made up of volunteer parents. You must be a member of CHESS to participate in CHESS sports. CHESS Co-op is a gathering of homeschool parents and students who cooperate in sharing teaching responsibilities. They meet once a week for 22 weeks a year and are all volunteer. 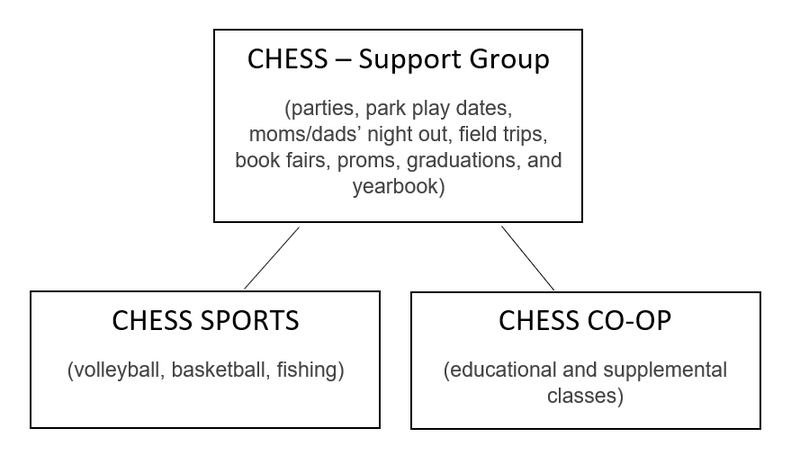 The CHESS co-op has a separate board made up of volunteer parents and you must be a member of CHESS to participate in the CHESS co-op.